You can go months without ever thinking about the needs of your car, other than the occasional trip to the gas station. But it is crucial that you don't forget, your car does require other services from time to time. Routine auto maintenance is critical for your car's overall well-being. While it may seem strange to have to pay to have your already-well-running vehicle serviced, doing so will save you hundreds or even thousands of dollars in the long run. Let's take a closer look at auto maintenance. Preventative auto maintenance consists of a many different services, here are a few of the most common. 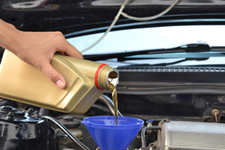 Oil change - The service your car will require the most is an oil change. It is conducted every 3,000 to 5,000 miles to ensure the engine is properly lubricated. Fluid services - All vehicles utilize a number of other fluids, such as brake fluid, coolant, power steering fluid and differential fluid, to operate. From time to time these need to be drained and refilled, called a fluid flush, to ensure they're free of contaminants. Transmission service - Transmission maintenance includes a transmission fluid flush, cleaning the transmission pan and cleaning or replacing the transmission filter, if applicable. Timing belt - If your car uses a timing belt be sure to have it replaced on time. If it is not replaced it could snap, resulting in catastrophic engine damage. Tune up - If your car just doesn't seem to be running quite right it could be time for a tune up. Tune ups consist of small maintenances, such as filter replacements, that help the car run at peak performance. 30/60/90K services - Most other services will fall under 30/60/90k maintenance. These are services done every 30,000 miles to help prevent breakdowns and other issues. It may include new spark plugs, new ignition coils, battery services, safety checks and more. The ultimate reason your car needs maintenance is that it is not a perfect machine. Without maintenance parts would begin to degrade and break, leaving you stranded on the side of the road, at best. Check your owner's manual to see what services your car needs and when. If it is time for auto maintenance in Palo Alto or the surrounding area be sure to visit The Car Doctor. We will take excellent care of your car, including dealership style auto maintenance. Any time you car needs scheduled auto service in Palo Alto give us a call at (650) 492-6853 to make an appointment!